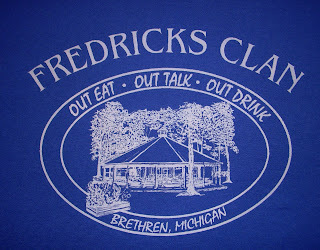 My husband and I attended the Fredricks family reunion this past Saturday, July 10th. As stated previously, the Fredricks side of my family has been having reunions for years. I had a new look on the reunion this year. I wanted to make good use of my time and see if I could get some of my genealogy questions answered. One of the things that surprised me was the number of people who thanked me for posting pictures and information on the family. 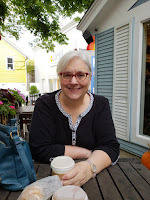 I have a Fredricks Genealogy Group page on Facebook, in addition to this blog. Isn't it nice to be thanked for something that you enjoy doing? I would never have guessed it brought enjoyment to others. It also gave me the opportunity to encourage them to post pictures and information on the group page. The first thing I saw when I arrived at the park was a group of people going through a box of old pictures. How fun. One of my cousins, had gone through her mother's house and found a bunch of family pictures she wanted to share. This same cousin had previously sent me some family pictures as she knew I was researching the family. The time around the 'picture box' provided some good information and helped to identify those in the pictures. Shortly after looking at pictures, another cousin came up and said she wanted to introduce me to someone. This 'someone' was a first cousin of my mother's. He had a piece of paper and was looking for genealogy information! I was very happy to meet him, Bill Fredrick, for the first time. We chatted and agreed to sit down and chat further after we ate, which we did. We compared what information we had and decided it would be easier to just chat and then exchange detailed information via email. Since he was from one line of the Fredrick family and I was from another, I knew I could fill in the blanks from my family line. My great grandfather was in the military in Prussia right before he left for America. Before we left I made sure I visited a cemetery, the museum, and took pictures that will be posted in future blogs. Brenda, I enjoyed reading about the reunion. What a wonderful way to meet relatives and share information. They must love the fact that you showed photos and blog about their ancestry. Barbara, I think they enjoyed it-I know I did!